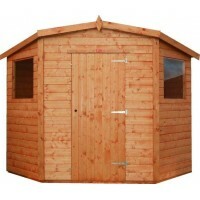 Perfect solution to ensure that all your space is utilised, TJs Corner Shed is available in 3 sizes as standard. All timber used is tongued and grooved, the timber is protected using a solvent based treatment. Full details are available under the product description. The perfect solution to any garden to utilise all the space available. TJs Corner shed is avai..